We’d been on the water for only a few days and yet the gentle rocking was already so natural beneath my body that I had forgotten the relief of solid ground. Stepping down onto the shore sent a prickling of pinpoints up through my calves. I wobbled but forced myself not to fall. Drew stood a little away from me, gaze towards the ground. I wondered if he saw something or was simply trying to orient himself to the stillness. “Why is there no fog here?” he asked. I didn’t think he was asking me, so I didn’t answer, but then he turned my way. “Maybe it can’t go over the water?” I said. I took a couple of steps forward. There was a copse of trees about ten yards in front of us. Darkness was held inside, but still I moved towards them. It was more words than we’d said combined in the past day or so. Somehow that was what had started to scare me—more even than the fog hovering across the shore behind us. It felt like maybe we were preparing ourselves already to give in to it. The first few months of our relationship had been the need for constant stories between us: our days described closely to highlight the things we thought the other might find funny; our childhood memories spooled back and forth to each other; our dreams retold in such vivid detail that I’d started to remember them better, becoming more present in them even as I was dreaming. We’d only been out on the lake because he said he wanted to show me something he’d remembered. We rented the boat and he rowed out past where I’d ever been. Ten years in the city and I’d never gone out on the lake farther than the end of the piers. I’d never felt bad about it until we were out there and I felt like the whole sky was embracing me. The air smelled different on the water, sharper and cooler as I breathed it in. I was going to respond, tell him what I’d wanted to tell him for weeks at that point. I was always waiting, afraid of the way my heart sped up its pace when I thought of it. But when I opened my mouth, our phones went off in tandem. The shrill sound of an emergency alert. We looked down at the screens. A message read simply: The fog’s rolling in. I looked to the lake, expecting a storm, clouds, something, but Drew gestured back towards the city. A blanket of dense white was pouring across it; it reminded me of an avalanche I’d seen on TV once. All that white crushing down in waves. I thought I heard screams, but now I’m not sure if I did, or if those were just inside my head. The island was the only thing Drew could think of; he knew it wasn’t so far from where we were. He said people camped there sometimes, so maybe we’d find someone else. Our phones had stopped working as soon as the fog came. The emergency alert had been the final sounds we’d heard from anyone other than ourselves. Later, when I gasped his name it sounded strange in the air, like a phone ringing in a home you know to be long emptied of anyone. “Hallie,” Drew said from next to me. I snapped back into focus, pulling my hand up from the water. I looked to him, but he was staring into the water. All around us were flickers under the surface. He reached out and dipped a finger into it before pulling his hand back quick. We kept our hands inside the boat. Sometimes, I’d look into the water and watch faces float past; once I saw a tree with someone’s initials carved into the bark. On the island, there was no one. We shouted for a while, walking around the copse of trees. I knew that neither of us quite wanted to step into the darkness that seemed to ooze out of it; it reminded me of the mouth of a cave. That night, we laid on the beach. Our bodies touching at the hips. It felt good to be still, to not feel the water and the shapes it held moving beneath me. At some point, Drew moved to face me. His lips were the same as I remembered them, the pressure of them on mine, the taste of him. Later, when I gasped his name it sounded strange in the air, like a phone ringing in a home you know to be long emptied of anyone. In the morning, we got back in the boat. “We’ll try to find the other shore,” Drew said. The water below us rocked and rocked. I tried not to watch the shapes, shimmering and trying to break free from beneath the surface. After some hours, we stopped rowing, let ourselves drift for a while as our bodies rested. “Look,” Drew said. 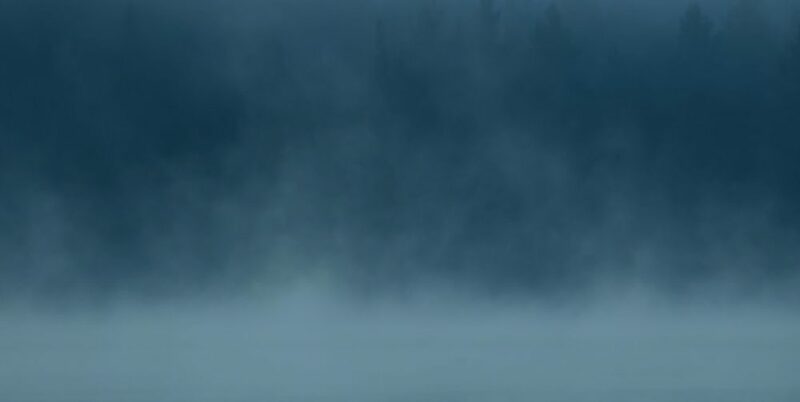 I turned and saw the fog rolling across the water; whatever had been holding it back must have broken, or given up. “We must seem so small,” Drew said. Under the water’s surface, for a moment, I saw my own face staring up at me about to say something. I wondered what it was.